Ellie, Magda and Nadine continue their story in this second double-bill from Jacqueline Wilson’s super series. The girls are growing up. They’re finally meeting the boys of their dreams – and realising that not every match is made in heaven. Girls’ nights out and new experiences offer high points. But they’re also taking exams, facing heartaches and saying goodbye to much-loved pets. When it all gets too much and the trio are in rivers of tears, can they use the power of friendship to get through trying times? Told in Ellie’s voice, this is a funny, frank and revealing look at love and friendship which older Jacqueline Wilson fans will adore. 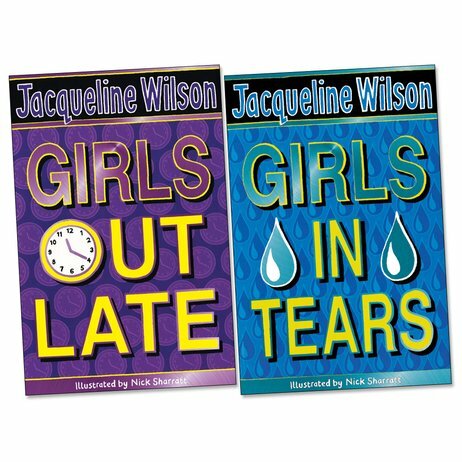 Love both of these books and out of the whole series (which is more than these two,I think there are five all together) my favourite is Girls Out Late. Would definitely recommend the whole series to a friend! I am reading both of these books. I prefer Girls out Late because I think it is more interesting. I recommend these books to 11+.